Despite the solemnity of this vow as a basis for research, the workshop at the AGGV was conducted with a more upbeat tone, focusing not only on Japanese Canadians but other Asians as well. The objective of the workshop was to use maps as a community engagement tool. By collecting stories and prompting conversation about the various communities in British Columbia, the project coordinators could then relate them to the history and experiences of Asian Canadians growing up on the Island. The conference room in the Spencer Mansion was set up for the workshop with tables scattered around the room, each with a large map spread across the surface. 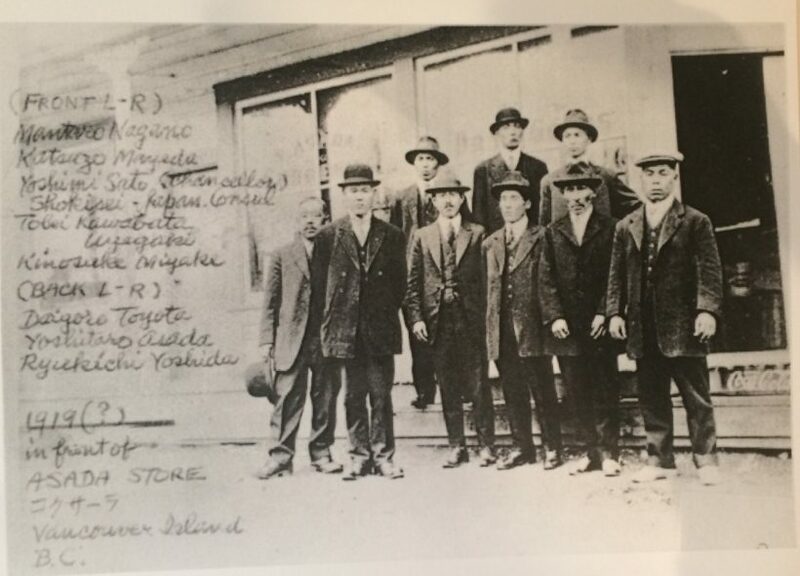 Additionally, there were flyers, old black-and-white photographs, copies of newspapers and various publications and documents about the history of Asian Canadians on Vancouver Island. Spearheading the workshop was Michael Abe, project manager of Landscapes of Injustice. As a third-generation Japanese Canadian, Michael started the ball rolling by telling the story of his own family’s history on the Island, starting with a small community of immigrants gathered in Paldi near Lake Cowichan. He went on to describe a general store that his great-uncle owned in Duncan in the early 20th century, which was mentioned and illustrated in the book Gateway to Promise: Canada’s First Japanese Community (2012) by Ann-Lee Switzer. Using family anecdotes passed down the generations and the contents of Switzer’s book, Michael was recently able to locate the exact address of the store in Duncan, thereby confirming certain facts about his family tree. The process through which Michael was able to expand on his family’s history on Vancouver Island exemplified what the UVic project facilitators hoped to achieve for the duration of the workshop. Participants were encouraged to chat informally about their experiences, either growing up as Asians on Vancouver Island or as friends and neighbours to Asian Canadians. To gather the information, each story or experience was jotted down on a slip of paper, numbered to correspond to a numbered sticker on the large map in the center of the conference room. Progress was slow to begin with. But as the participants warmed up and got to know each other, they gathered in small groups to discuss their experiences over tea and cookies. Gradually, the maps on the table began to be populated by little numbered stickers to indicate a memory of a place. For more information about the project, please see www.landscapesofinjustice.com.